Hanging out with Los Angeles’ La Santa Cecilia is the same as hanging out with a group of brothers and sisters. The uni-named lead singer, Marisoul, sits comfortably on the couch at In the Flesh Tattoo Parlor on Sixth Street. 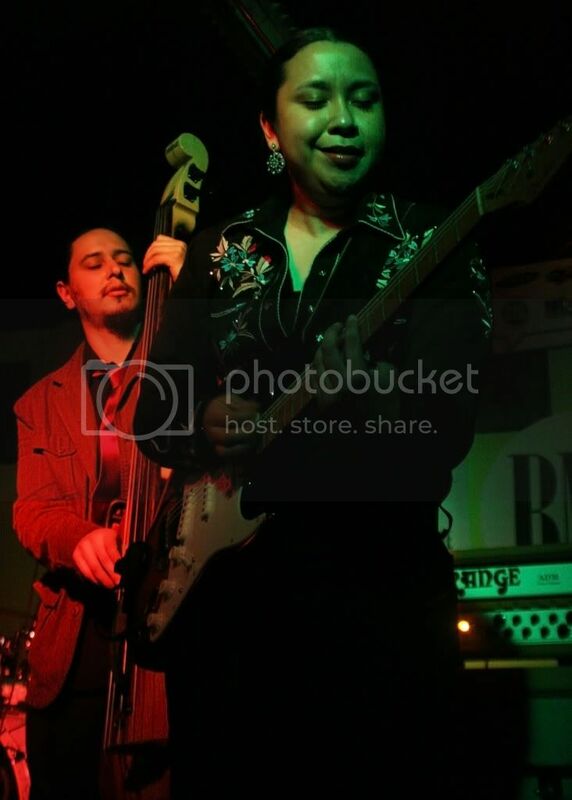 The boys, accordionist Jose Carlos, bassist Alex Bendana, percussionist Miguel Ramirez and drummer Hugo Vargas, jostle each other to make room for guitarist Gloria Estrada. The LA band’s mix of Pan-American-by-way-of-California music has been used in an independent feature film, a documentary and Showtime’s Emmy-award-winning program Weeds, but it’s their homespun style that endears fans. Why “La Santa Cecilia” for the name of your band? Miguel: We just thought we wanted a really strong name to represent the faith that we have in music, so it’s not like a religious thing even though she is the patron saint of musicians in the Catholic religion. It’s more so we wanted something to represent our faith in music, you know, so it just made sense. And it’s a feminine name for a band that’s fronted by two girls, so it’s special in that way. Marisoul: And also there are Santa Cecilias all over the world, like bandas Norteñas, cumbia bands, all over and especially in Mexico. You go to any pueblito anywhere and there is always a band that’s called La Santa Cecilia and we thought it’s a really nice thing to have a band that has the same name that reprents the pueblo, so we wanted to be La Santa Cecila de Los Angeles. Miguel: Hey, Los Angeles is son pueblo tambien, eh? But people forget because it’s a huge city, but it’s originally a pueblo. Your EP has been out for a while. What’s the story behind the recording? Marisoul: We’ve been together for two years and a half years, so it was recorded two years ago. We had just started and we just wanted to record something because we wanted to get more gigs. We wanted to play and we just saved up our money and went to a studio, and a friend was doing an internship so we got to go into a really nice studio to record. And it’s just that little thing we recorded has been great to us; people have liked it. But we definitely want to record something of better quality; we want to show what we’re doing now. 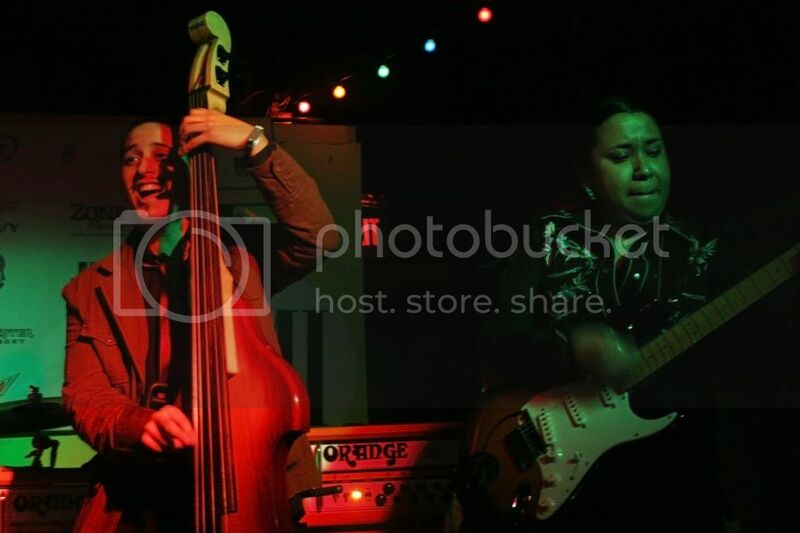 I feel like we’ve grown and we’ve meshed more as muscians together. Yeah, we’re happy about the EP but we’re so looking forward to recording a fuller album, hopefully soon. Marisoul: But it’s true right? It’s like que cosa rico, you know? Cuando haces un caldito, you just don’t put the stuff in and then it’s cooked. If it’s cooked great, you got to let it simmer til all the flavors come together. Miguel: The process of writing our music? Well, it’s pretty challenging. We first come up with an idea, and we try incorporating all different styles or whatever works with that song. It’s kind of like Marisoul says, it’s like a soup; we throw all our influences in the bowl of soup and then we mix it. 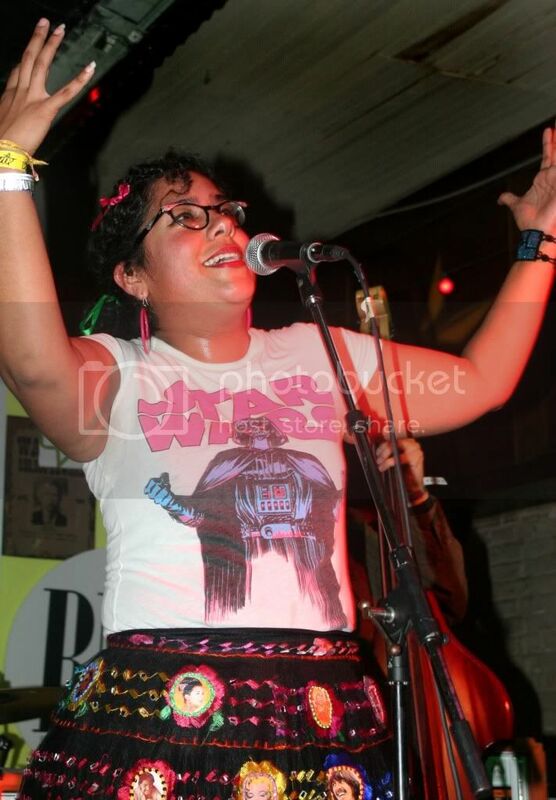 La Santa Cecilia has been described as a having a “Pan American” sound. How would you describe the music? Miguel: We’re very much a California, LA interpretation of a Pan American sound, right? So we’re interpreting these things, our influences or styles through a very like California/Southern California/Los Angeles lens, you know, like filters, because that’s where we grew up. We can’t deny our sound’s going to be natural from where we come from. So it’s not like a pure traditional samba or pure traditional Norteña or a pure traditional shuffle, jazzy song. It’s how we feel or how we interpret, naturally, our songs. So I guess it’s cool that it comes out that way. What’s a “Southern California” lens? Alex: It’s everything. You got Latinos from all over Central and South America. You got people from Europe and of African-American descent. You got all sorts of things, like a melting pot. We grew up with American music like The Doors, Red Hot Chili Peppers, a lot of mexican influences, mariachi, there are a lot of mariachi’s there, you know. There is just a melting pot of different types of music. You’re going to hear all that influence there. You’re going to hear that American influence with the Mexican. That’s kind of what our music represents there. What track from the EP speaks to you? Marisoul: From the CD, I love “Chicle” because it talks about esos consejos, the advice that my mom, grandma or my tias would give. And when we wrote that song, it was very much about how sometimes, when I was young, I’d be like “Mom, you don’t get me. Man, like my problems and my feelings have nothing to do with your consejos, dichos or none of that,” you know? I was going through my own thing, right? But I was wrong, I was so wrong and it wasn’t that she didn’t understand me, it’s just that I wasn’t understanding what those dichos meant. And with that advice, I think, it’s very important to keep in touch with our family, with our mothers, our fathers, our tios, our tias. They alway have something to say there’s always something to learn from your elders. I love that song because of that. An interesting way you package your CDs is by having parties where fans can decorate the covers. How did that get started? Marisoul: It does take forever, but I think it’s a beautiful way to do things different, you know? Getting a CD printed a thousand times or who knows how many times is just so generic. I dont’ think we’re generic with our music; we really try to detail and experiment with the sounds and things like that, that I think doing it handpainted is another way of expressing who we are and setting us apart from all the bands. Miguel: Marisoul has always pushed it in the sense of saying the art, the visual artwork is just as important as the music. It was when records were huge in the ’60s and ’70s. The cover was huge, so it’s like taking it back to that; this is just as important than what’s inside, so it’s a big thing for her and she pushed that and it’s worked out really well.